Through Serving you will discover how to fulfill God’s plan by giving back to others. Students will be involved in a variety of volunteering activities throughout the community. 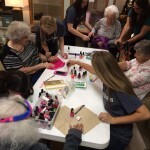 You will learn the importance of giving back by serving others through annual service opportunities like the Senior Faith Project and various volunteer groups. Through these services, you will learn how to serve God while serving others. SERVICE MORNING – For the first half of our fall Community Day, staff and students travel from school to more than 40 sites throughout the area to do community service. They work for non-profit ministries, camps, schools, retirement communities, and many other individuals and organizations. The two hour window spent at most of the service sites is short, but it is typically long enough for both the givers and the receivers to be blessed. After returning to school, staff and students continue to celebrate community with the afternoon Mixer. STUDENT VOLUNTEER ORGANIZATION (SVO) -The SVO is the Student Volunteer Organization at South Christian. It is exactly what it sounds like – students volunteering their time to help further God’s kingdom. It is amazing what can be accomplished by working together. It is also a great way to form new friendships. Most of the volunteer opportunities with SVO take place after school and transportation is often provided. The SVO board in Mr. Springvloed’s room (room 24) keeps students up-to-date on their chances to serve and also offers sign-up sheets and the forms that might be required. Volunteering begins in October but students can join at any time. TWELVE DAYS OF CHRISTMAS – The Student Council collects food and cash from the student body to provide 80 area families with a Christmas food basket, complete with a Bible and gifts for the children of the family. VICTORY DAY – On a Saturday each September, the Sports Park is filled with football players, cheerleaders, pep band members and many fans to help over 50 people with needs enjoy a memorable day as either a football player or cheerleader. 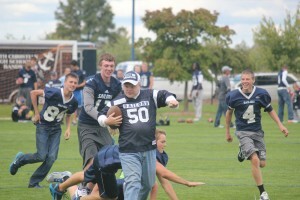 Each participant is paired with a South Christian student and given a chance to score a touchdown or cheer the players to victory. VENISON FOR LOCAL FOOD KITCHENS – Deer hunters can donate venison to local food kitchens by taking it to Stegink’s Deer Processing (100th Street west of 131 Expressway). The SCHS Student Council pays for the processing and Stegink’s packages it to the specifications of local food kitchens. WORLD VISION CHILD – SCHS students are sponsoring eight children through World Vision. A different child from around the world is featured each month. This is a $2,500 commitment per year for the student body. Offerings are taken once per month and containers are located at the book store and candy store for donations.